A remarkable journey by Black's queen over the last four moves establishes equality - it took real imagination by Szabo to solve the problem of his queen on b8 to put it via b5, c4, and g4 to f5...just to trade it off! Bronstein: Taking with the pawn hems in the bishop still more severely, but 28. Bxd4 would result in a lost position after 28... Rb5 29. Rxb5 axb 30. 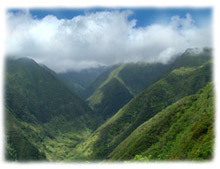 Ra1 Ra6 31. Kf1 Kf8. Oddly enough White has no plan to improve his standing - if the king tries to support a kingside pawn push and wanders away from the queenside, Black can just push ...b4 at will because cxb4 Bxb4 loses the a-pawn, and ...c5 is coming as well, creating a protected passed pawn. 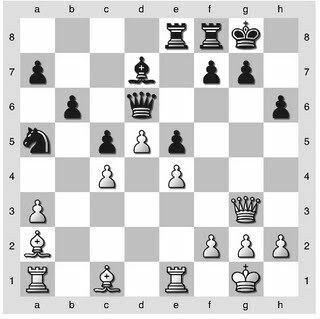 Even with the White king on the queenside the plan is the same just slower - White has no way to push through a pawn of his own. So Gligoric's 28. cxd4 is correct, although the reason is not obvious. 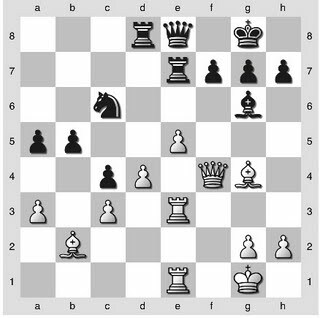 Using threats to the a-pawn Black achieved the exchange of rooks and finally won the forlorn a-pawn and is left with an endgame where his bishop is monumentally better and he has an extra outside passed pawn....and indeed White resigned in a further few moves. 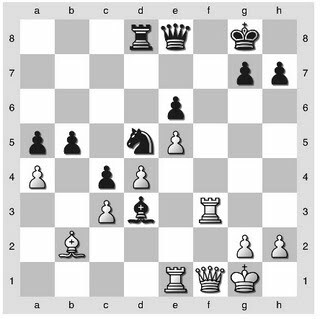 (Despite the impressive-looking e5 pawn, Black can play an eventual ...f6 and fxe after which he can overload the defending White bishop from either the d- or f-pawn depending on which is remaining by a ...d4 or ...f4 pawn sacrifice and mop up the White pawns with his bishop). PS See Mike Goeller's comment to the post below about where you can play through all of these games for free on chessgames.com. 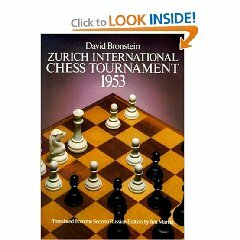 The candidates tournament of 1953 in Zurich to choose a challenger against Botvinnik was brilliantly annotated in a bookshelf-busting 350 page book by David Bronstein. He was one of the participants in the 30-round (!) double round robin of 15 of the top players in the world at that time, including former world champion Euwe and future world champions Petrosian and Smyslov, along with three of the greatest also-rans of all time: Bronstein, Keres and Reshevsky. The genius of the writing in Bronstein's 1st (and only?) chess book is that the key plans for each side are detailed in a verbal style that can be understood without having a board in front of you, i.e. pointing out that the key to the position is a certain weak square, and that the next 10 otherwise incomprehensible maneuvers are each side's effort to control it. Many GM's have called it their favorite book of all time. Best of all, it's still in print and costs $10.17 at Amazon (I got it for $9 at a sale at the USATE last year), so no excuses, you should really own this. 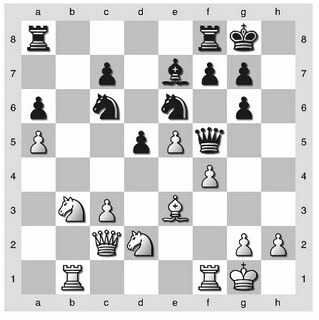 Bronstein: Black must stop White's pawns, so Petrosian gives up the exchange at a spot of his own choosing, freeing e7 for the transfer of his knight to d5 [Centralization! Blockade! -IM]. Of course, Black gets good compensation for the exchange: his knight is much stronger on d5, as is his bishop, which no longer has an opponent. Kasparov: ...let us ponder over the position and ask ourselves: why, in fact, should a rook be stronger than a minor piece here? 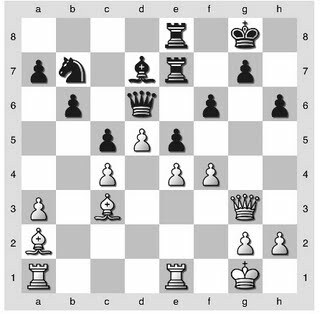 After all, a rook requires open lines, it needs something to attack, whereas minor pieces require strong points and pawn support. 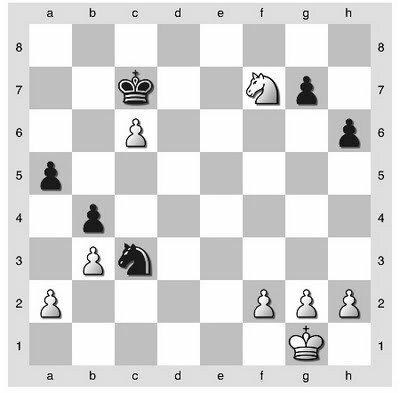 In the given instance there is a shortage of open line, and it is no longer possible to stop the knight from reaching d5, where it will be impregnable. 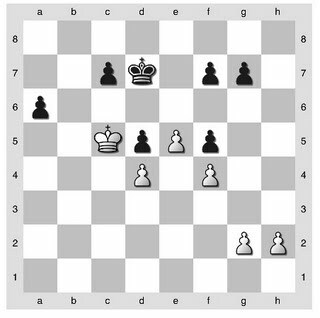 In addition, from d5 the knight will be attacking the c3 pawn, and if the white bishop does not manage to switch to d2, it will remain 'vegetating' at b2. 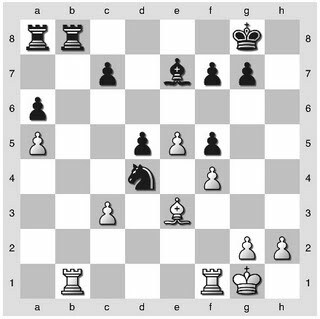 It is practically impossible to break Black's light-square defences: White simply does not have resources to do so. 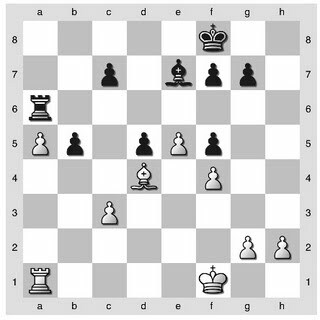 is complicated by the fact that the position is not fully closed (compare this with game #2 below) - there is potential for an opening in the queenside, and this is what Reshevsky first tries for and what Petrosian had to anticipate - if the queenside is opened it is likely that White may still be able to win. 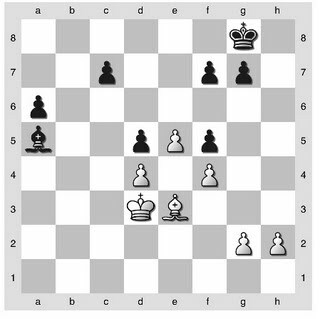 And here, Reshevsky returned the exchange with Rxd3, after which the game was soon drawn. An exciting game, and a defensive triumph. 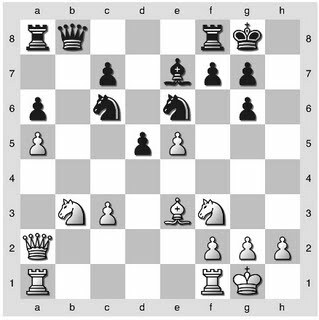 Bronstein: How is Black to meet the impending attack on his king? 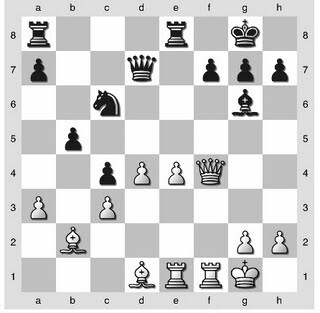 He must ready himself to weather the storm by placing his pawns on the dark squares, his rooks on the e-file and his knight at d6 where it blockades the pawn and covers the light squares. And so he does...but to do this requires forseeing an exchange sacrifice. Bronstein: Black shores up e5 with might and main, pressing simultaneously on e4 with the hopes of inducing f4-f5. Another exchange sacrifice! One that didn't appear on the board and yet one that determined the course of the game. All the same, this sacrifice, if it occurred, is a simpler case than the Petrosian example because here there is little prospect of open play anywhere on the board after the sacrifice. I wish I had saved the position, but a week after reading this I pulled off this exact sacrifice (rook on e5 for the dark-squared bishop) against a computer in the Nimzo-Indian, and the surprised machine shuffled its pieces for the next 50 moves until it called a draw. A good trick to know. Random question if anyone knows - did someone put out a book on a Sicilian repertoire based on 1.e4 c5 2. Bc4? I'm seeing that a lot in the last 2 or 3 months after never seeing it before. It seems like a really limp Sicilian for White, so it would be strange if someone were making money off of a book on this. 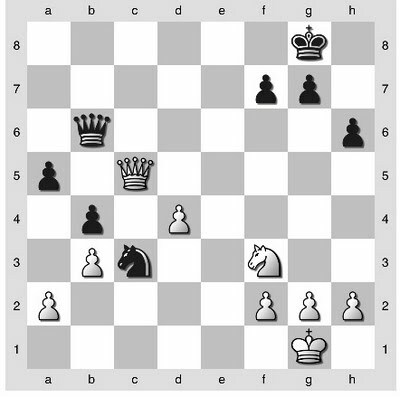 The following was one of my games from the National Chess Congress last month. See what happens when one goes pawn grabbing. I am testing out some different ways to display the games. Hopefully, I will have some entertaining games while doing this. Next one perhaps...Ian vs Don! Where your day should start, with a problem of the day featured prominently on the front page. Want more? There's a database of historical games populated by users (you can even add your own games though they ask that at least one master-level player be involved), and an openings database that is my first reference point. Also there are live broadcasts of high-profile games with kibitizing that is somehwere between 100-1000x more intelligent than what you'll get off ICC users. To get some of the better features requires $25/year, though. Too cheap to shell out for ICC? Chess.com features free online chess, both blitz and correspondence. The server's a little choppier than ICC, but hey it's free so no complaining. Really a killer value, could bump up to #1 on my list someday. They've got other stuff (video lectures, etc) that costs $$, but there's no need for that. plete with picture reports which for some reason tend to focus on pictures of the ladies of chess (whoever they may be). Good analysis, and 100% free of charge. s, analyses more and analyses better. If you want a free insight into the mind of a GM, look no further. A free tactical puzzle database that keeps track of your results and even assigns you a rating reflecting your progress. No need for puzzle books anymore, it's all right here. 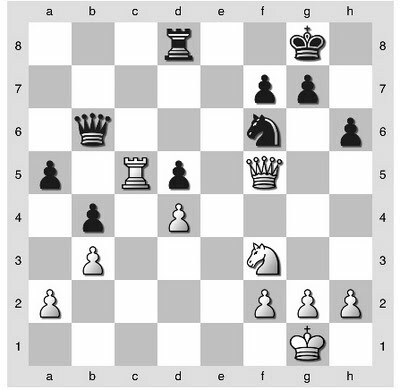 Where Black is even better here, with the potential to quickly grab the White Q-side pawns. This does not represent White's best continuation in an admittedly complex endgame, but the points I should have focused on in my time pressure are: 1) The king has time to stop the passer 2) This will be incredibly easier without queens on the board 3) both White pawns are vulnerable because of the ...Nxa2-c1-b3 maneuver 4) Black's advanced pawns on the Q-side represent his only threats. Based on this it would have been an easier decision to go this endgame. Alas.